Describing himself as “never personally involved” in politics, Mike Lisenbery, 33, started to trade texts about political candidates with friends where he works at the Costa Mesa Apple store prior to the Democratic and Republican national conventions last summer. A friend sent the group a link to the Indivisible Guide, which television talk show host Rachel Maddow explained for her viewers on her MSNBC show Jan. 6. By then, Lisenbery, of Huntington Beach, decided to check out the Indivisible site. It offered two options at the time: talk to your congressperson or start a group with 5-10 like-minded citizens. Lisenbery started a Facebook page for the 48th Congressional District, whose voters from Seal Beach to Laguna Beach re-elected Dana Rohrabacher last November. “It had 200 members in the first week,” he said. His conversion to activist took a push from Sharon Toji, of the Indivisible OC 45. That group is pressing Rep. Mimi Walters, of the 45th Congressional District in south county, to hold town hall meetings. Toji encouraged Lisenbery to start Indivisible OC 48. Since the November election, political neophytes such as Lisenbery, who once regarded voting the extent of their public duty, have slowly evolved to step into leadership roles within fledgling protest groups in order for their voices to be heard by their elected officials. Like Lisenbery, the Indivisible team are all volunteers “Our only goal is to help the real leaders on the ground who are resisting Trump’s agenda on their home turf,” the website says. The Indivisible; A Practical Guide for Resisting the Trump Agenda came on line, by the authors’ own description, as a poorly formatted, typo-filled, Google doc in December 2016. To date it has been downloaded over 1 million times by 4,500 groups in nearly every congressional district in the country, the board of indivisibleguide.com claims. The Guide is licensed under the Creative Commons Attribution-NonCommercial- ShareAlike 4.0 International License. Former congressional staffers who witnessed the rise of the Tea Party are the authors of the Indivisible Guide, which is a 25 page, step-by-step playbook for individuals, groups, and organizations looking to replicate the Tea Party’s success in getting Congress to listen to a small, vocal, dedicated group of constituents, their website says. 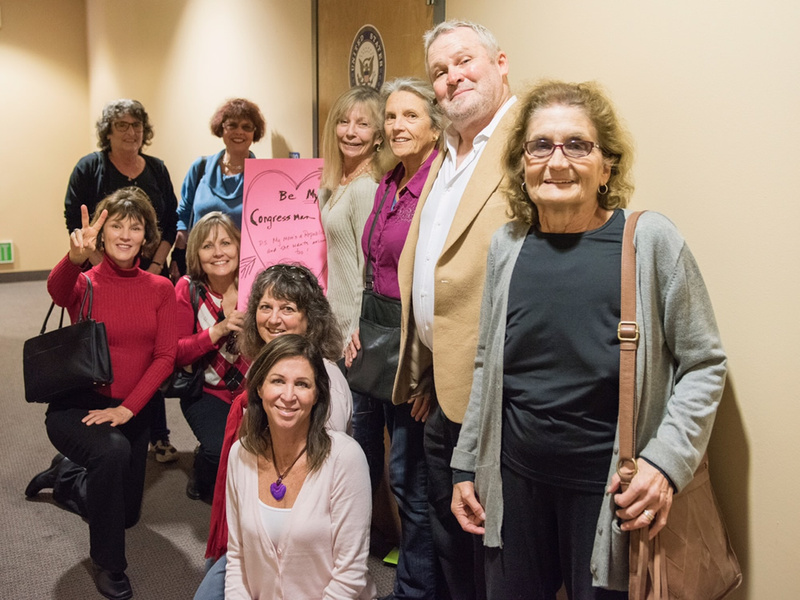 Patti Jo Kiraly holds a Valentine among other activists from the Indivisible OC48 Tuesday, Feb. 14, at Rep. Dana Rohrabacher’s office in Huntington Beach. Photos curtesy o Patti Jo Kiraly. Sue Dvorak, of Newport Beach, attended the women’s march in Santa Ana after Inauguration Day. It was her first political event, but now she’s one of the principal organizers in OC 48. “This is a 100 percent grassroots movement; we are all volunteers,” she said. Now with 1,500 Facebook page members, the group is working to refine its focus on health care and the environment. 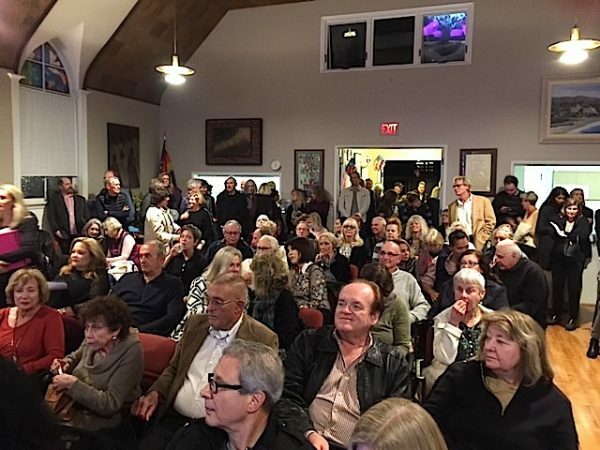 She said attendance at meetings of Newport Beach’s Democratic Club has doubled. A similar phenomenon is taking place in Laguna Beach and San Juan Capistrano, according to Fran Sdao, chair of the county Democratic Party. At a well-attended meeting of the Laguna Beach Democratic Club preceding the women’s march, some members brought their adult daughters, recalled Audrey Prosser, a club member. “We all shared our feelings about the election and the younger women were energized to get involved,” she said. Speech therapist Lynn Epstein, who joined other Laguna Beach residents at the women’s march in Washington, D.C., also recently joined the local Democratic Club. There, she learned of another grassroots movement, WAVE4all . Women of America for Values and Ethics is comprised of 80 people and was started by a San Juan Capistrano attorney after learning that some of her friends voted for Trump, Prosser said. Epstein plans to check out that group as well. The WAVE group and the Laguna Beach Democratic Club along with the Rancho Santa Fe Democratic Club have planned an “activist training day,” Take Back the House in 2018, for Sunday, March 5, at the Newport Dunes Bayside Pavilion. Organizers hope to at least half fill the 900-person venue at $15 per person to hear Sara El-Amine, the director of Organizing for Action, a 20 million-person strong grassroots movement which advocated for former President Barack Obama. Another local activist group plans the Courage Campaign, which will send “search parties” and hold vigils outside the homes of California Congress members who have not scheduled town hall meetings during this week’s congressional recess. Ed Royce of Fullerton and Rohrabacher’s homes are on the list. Laguna local Carrie Reynolds’ first activist move was mobilizing friends to attend the Jan. 21 march in the nation’s capital. Now she plans to attend the training day in Newport. The Laguna Beach Democratic Club draws a standing room only crowd at a strategy meeting earlier this month. Patti Jo Kiraly, a 32-year Sawdust Festival exhibitor and past president of the Laguna Beach High School PTA, says she’s never before been involved in politics beyond voting. “I am not an activist, really,” she said. Nevertheless, she’s marched in Washington, attended a Democratic Club meeting which she described as “packed,” and participated in one visit to Rohrabacher’s office to request he hold a town hall meeting. “I was curious to find out what our representatives are doing,” said Kiraly, adding that while she did not vote for him, she’s had no particular complaint against him. Kiraly hopes the March 5 training will emphasize peaceful and respectful activism. Prosser says the training goal is to be “effective and strategic.” With the skill sets of newer and younger Democratic Club members, “we now have the tools to make change,” she said. Great article thank you. Its nice to hear that our efforts are voluntary. Your description of the voter only turned activist is my story too. Thank you for sharing the reality behind the bogus “paid protesters” claim. I have never been politically active before, but now I find myself knowing who my congressman and senators are, attending rallies and indivisible meetings. I think a lot of us have simply been propelled into action. Hi Judy: please sign up for the Firebrand newsletters at the homepage and like us on Facebook.